When I first heard about an “ice hotel,” I thought it must be a joke. I’ve heard of igloos, of course, but that’s not really the image that comes to mind when I think hotel. Sure, there was the Bad Guy’s ice lair in the James Bond film Die Another Day, but that’s just fantasy, right? The thought that someone might really construct an entire hotel out of ice, rent rooms, and then repeat the process each year was almost too wacky to believe. Believe it—not only does it happen, it has become one of the trendiest ways to spend a winter vacation. The first ice hotel was built in 1989 in a village called Jukkasjärvi in northern Lapland, Sweden. That first year it was a modest, 60-square-meter igloo; in the 2018–2019 season, the structure measures over 6,000 square meters and has about 100 guest rooms. Construction begins each year in October, and the hotel is open for guests from December through April (weather permitting). By summer the hotel has melted, but plans are already underway for next year’s bigger, better ice structure. Ice hotels are built, naturally, entirely out of frozen water in the form of ice blocks and hard-packed snow. In some cases, blocks of ice are sawed from a river; for other parts of the building snow is compressed into wooden forms to create building blocks. (The Icehotel in Jukkasjärvi uses a mixture of snow and ice they call—wait for it—snice.) The guest rooms contain beds made of a block of ice and typically topped with a foam mattress. You sleep in high-tech mummy-style sleeping bags covered with animal pelts; although the air temperature in the room is below freezing, your body remains toasty warm. If nature calls in the middle of the night, you can head to an adjoining heated building with conventional facilities. Outhouses would not be much fun with outdoor temperatures routinely reaching –40°. But a classy hotel is much more than a place to sleep, and at the prices of these rooms, you’d better get much more than a sleeping bag. Although the design changes from year to year, Sweden’s Icehotel invariably includes an ice bar for vodka-based drinks (beer would freeze); even the glasses and plates are made of ice. There’s also an ice chapel for “white” weddings, and in some years there have been ice cinemas, ice saunas (I have yet to figure that one out), ice art galleries, and even—I am not making this up—a replica of Shakespeare’s Globe Theatre built of ice. Most guests stay only one night in an ice room; ordinary heated hotel rooms are available nearby for longer stays. Even so, the hotel is such a hot property (so to speak) that waiting lists are sometimes several years long. Sweden’s Icehotel was the first, but imitators have sprung up all across the northern climes—though sometimes they last for just a few years, until the novelty wears off. Finland and Norway both have ice hotels, and similar facilities can also be found in lower latitudes—including in Switzerland, Romania, and even Japan. In Canada, Québec has its own ice hotel, Hôtel de Glace, modeled on the original Swedish Icehotel and rivaling it in size and luxury. In 2004, the United States saw its first ice hotel—the Aurora Ice Hotel at the Chena Hot Springs Resort in Fairbanks, Alaska. During its construction, state officials cited the hotel’s owner for fire code violations and did not permit the building to open until smoke detectors and fire extinguishers had been installed in each room. (I’m not kidding. Only in America.) Although the initial structure melted in the spring of 2004, it was rebuilt for the 2005 season, this time inside a larger, refrigerated structure—with the goal of keeping it frozen and habitable year-round. That hotel is no longer in operation, alas, but a permanent ice museum is open at the same location. 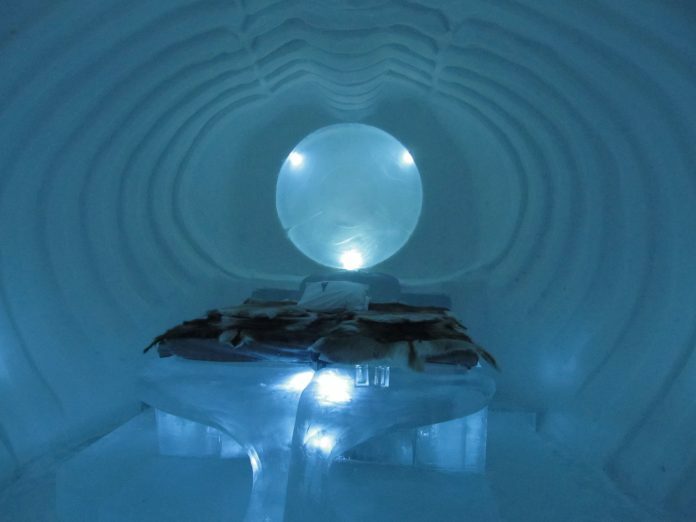 As far as I know, I’m not personally acquainted with anyone who has stayed at an ice hotel. I rather suspect—marketing hype and high prices notwithstanding—that it would be a decidedly uncomfortable experience. But then, many uncomfortable experiences are worth having, and it’s not every night you get to drink vodka out of an ice glass while watching the Northern Lights, and then sleep on a slab of ice. Sign me up! Note: This is an updated version of an article that originally appeared on Interesting Thing of the Day on October 21, 2003, and again in a slightly revised form on January 3, 2005.